Priming is a nonconscious form of human memory, which is concerned with perceptual identification of words and objects. It refers to activating particular representations or associations in memory just before carrying out an action or task. For example, a person who sees the word 'yellow' will be slightly faster to recognize the word 'banana.' This happens because the words yellow and banana are closely associated in memory. Priming can also refer to a technique in psychology used to train a person’s memory in both positive and negative ways. The power of subconscious priming on behaviour is not a new subject by any means - Vance Packard's groundbreaking work The Hidden Persuaders was first published in 1957 and explored the psychological and subliminal techniques used by the advertising industry. Fifty six years on, and whilst we know that priming can work both for and against us, its power can still baffle and amaze and its very nature means we're unlikely to realise we've been primed (perhaps until it's too late...). As John Bargh says 'Priming refers to the incidental activation of knowledge structures, such as trait concepts and stereotypes, by the current situational context.'. What has changed over the last 20 years or so, is that we have learnt a great deal about how our brains function and have at our fingertips granular detail and quantities of evidence about ways in which we can prime emotions, identities and behaviours. For instance, a study has shown that women - who are sometimes less confident in leadership roles - can be primed to feel empowered and more confident when delivering a speech in public if they can see a photograph of a powerful political female figure like Angela Merkel or Hillary Clinton. People can be primed to be more creative simply by being shown the Apple logo. And you can even prime people to be amused or to find things funnier by getting them to hold a pencil horizontally in their mouths so as to create a 'smile' shape. Priming can occur using many different inputs – visual, semantic, or via sounds, smells and tastes. And it can also be prompted by the many simple behaviours and tasks we do, and with lasting effects. Research has found the effect of priming can last anything from 15-20 minutes to up to two days with a constant impact (ie one that doesn't depreciate over time). Findings like these impress on us how susceptible we are to subtle, subconscious stimuli and influences. This article examines the range and breadth of what the behavioural sciences have uncovered and the types of useful and effective priming tools we can leverage in marketing and market research. Simple actions and behaviours can shape our emotions and how we feel. Daniel Kahneman points out that “Being amused tends to make you smile and smiling tends to make you feel amused.”. So putting a pen in your mouth horizontally can force you to form a smile expression and, as a consequence, you will feel happier. You'll also find jokes funnier. College students who were asked to rate the humour of cartoons from The Far Side while holding a pencil in their mouth found the cartoons funnier than those who were made to frown. Kahneman got delegates at the WEF in Davos to do the pencil smile experiment in his talk at the January 2013 forum! 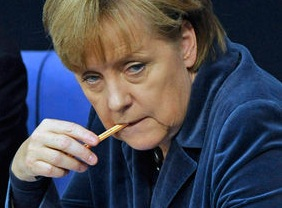 Likewise, putting the pencil vertically in your mouth makes a frowning, negative expression, similar to the image of Angela Merkel here and consequently makes you feel more miserable. We can also self-prime via the way we stand and present ourselves; our body position and stance can affect how confident we feel, as well as communicating levels of confidence to others. Amy Cuddy, a professor and researcher at Harvard Business School, studies how nonverbal behaviour and snap judgments combine to influence attitudes in people from the classroom to the boardroom. She has conducted some fascinating research on ‘power posing’ and points out that power is often expressed behaviourally by opening up – taking up physical space e.g. stretching, standing taller, leaning back, putting our hands behind our heads, legs stretched out and so on. Any physical movement that actually makes us take up more space and look bigger in fact. Primates and humans both do this to express dominance and power - just look at the triumphant pose of any winning athlete at the end of a race. The New Zealand All Blacks' pre match Haka ritual is another example of this - it works to intimidate the opposing team but importantly, also serves the All Blacks themselves, allowing them to self prime dominance and power. Cuddy notes that not only does “Your body language shape who you are” but also that “Your body can shape the mind.”. Her studies have shown that simply assuming different poses automatically releases different hormones into the body. Try this out if you need a bit of a power boost: lie back in your chair, put your hands behind your head and your feet on the table and this will trigger a release of testosterone into the bloodstream after a few minutes. When you need to take on an alpha role, assuming this pose will get your body producing more testosterone beforehand to prepare it and make you feel more confident. Similarly, cortisol (a stress hormone) will be released if you adopt a non-threatening, unconfident posture (such as drooped shoulders, hands in lap, touching your neck or standing hunched with your arms crossed). Cuddy and colleagues tested the effect of the power pose on candidates attending a job interview. Some posed beforehand (in private for a couple of minutes) in a high power pose and others in a low power pose. The result? The interviewers wanted to hire all the people who had been in the high power pose because they were considered to have more presence and confidence and appeared more authentic than the others. Rather disconcertingly other apparently more relevant qualities like experience and qualifications had no influence on the hiring decision. A recent study by Cuddy together with Maarten Bos (also at Harvard Business School), has built on these findings. They looked at the impact of different body postures in operating everyday technology – from smartphones and tablets, through to laptops and desktops. As in the feet on the table posture described earlier, using a desktop means adopting an expansive body posture, whilst using a smartphone constricts your body posture (especially if you're tall), causing you to hunch your shoulders and screw up your neck. In their study entitled ‘iPosture’ they found that more assertive behaviour tended to be linked to the size of the electronic device used – those using a larger machine tended to behave more assertively later on than those using a smaller device like a smartphone or an I-Pad. Bos says, “People are always interacting with their smartphones before a meeting begins, thinking of it as an efficient way to manage their time. We may, however, lose sight of the impact the device itself has on our behaviour and as a result be less effective.”. Images can also prime behaviour. For example, research has found that happier facial images can affect our consequent behaviour. A study looking at the impact of subliminal facial expressions – happy, neutral or angry – found that people who had seen a happy face went on to drink more lemon Koolaid than those who had seen either a neutral or angry face, especially if they were thirsty. Thirsty participants primed with a happy face poured themselves more than twice as much drink than those who had seen an angry face. They then went on to drink nearly three times as much. Even for those only moderately thirsty, the primes had a notable and statistically significant effect on how much drink they poured out. 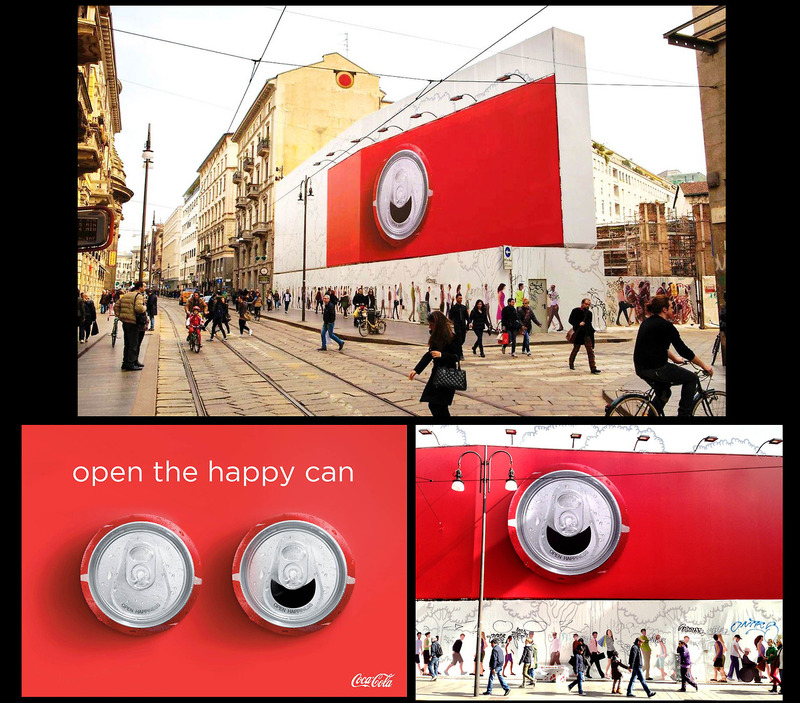 Coca Cola certainly seem to have grasped this idea in their latest campaign in Italy - ‘Open the happy can’. Huge billboards show the top of a can of coke with a ‘smile’ in the gap post opening. Every time you open a can, you get a big, wide grin smiling back at you. Brand images have been found to influence behaviour in really interesting ways. Researchers found that while priming people with an Apple logo made them consequently think very creatively in a simple task on ‘unusual uses for a brick’, priming with an IBM logo made them less creative and less likely to think laterally. In the same study, priming people with a Disney logo made them more honest. You can also be primed to behave more altruistically using images. A study by Nina Mazar and Chen-Bo Zhong, researchers at the University of Toronto, showed that when people were merely exposed to and primed by organic and environmentally friendly or ‘green’ products online, they were more inclined to act altruistically when subsequently participating in an ‘anonymous dictator game’. This effect only occurred with priming though. If they had purchased a green product as opposed to a conventional product, licensing effects – when we compensate for earlier ‘good’ behaviours - came into play and they were more likely to lie and cheat in the same game. Images can prime behaviour in more complex ways and actually improve our performance. We've already referred to a recent study which looked at how priming speakers with images of authoritative, successful female role models can instantly help female speakers feel, speak and behave more confidently and improve leadership qualities. The study actually included male and female participants, each of whom were asked to speak to a room full of people – a reasonably stressful leadership task. The participants were split into four groups – two groups spoke with an image of either Angela Merkel or Hillary Clinton fixed at the back of the room, a third group faced an image of Bill Clinton, and a control group had no image. The researchers recorded the length of the speeches as a proxy indicator of confidence and good performance. Priming with Hillary Clinton or Angela Merkel increased female speaking time by 24% and 49% respectively. Women in the Angela Merkel group spoke for over four minutes, compared to the control group or the Bill Clinton group who spoke for less than three minutes. Independent evaluators also rated all the speeches and tended to rate the speeches in the female role model groups more highly. Moreover, later self-evaluation of each of the female speakers showed that those who spoke for longer perceived their performance to be better. The primes had no effect on male behaviour. This kind of priming has more of a domestic application potentially, but there's no denying its powerful appeal. Psychologists at the universities of Utrecht and Radboud in the Netherlands first asked students participating in the experiment to complete a questionnaire sitting in a cubicle. There was a bucket of water in the room with them and it gave off the odour of a lemon scented all-purpose cleaner. Once they had filled in the questionnaire they went to another room (with no lemon scent) and were given a particularly crumbly biscuit to eat. Perhaps one of the simplest ways in which you can be primed, is through words and you can achieve pretty much anything like this. For instance, priming people with words related to rudeness leads them to behave rudely, whereas priming them with words related to politeness causes them, surprise surprise, to behave politely. And if you prime people with stereotypical perceptions of old folk and you can make them walk more slowly, more like old folk, in fact. Priming using words can also predispose a person to be more individual or more conformist. Experiments in social psychology have shown that priming people with words such as ‘individuality’, ‘solo’, ‘differ’ or ‘myself’ using a scrambled sentence task can remind people of their independence and make them less likely to conform to others’ views in any subsequent task. Likewise, people can be successfully primed to be more collectivist with words such as ‘we’, ‘us’, ‘cohesive’, ‘ours’ and ‘agreeable’. And asking people to read a short text or short story written in the first person eg containing words like ‘I’ and ‘mine’, or even to write a passage in the first person can help to heighten the individual's sense of identity and sense of self, and to encourage the idea of being freer from the influences of others. More worrying is the effect of male gender in a job application context where studies have shown that men tend to be regarded more favourably than women. A US study found that researchers assessing the employability of fledgling scientists subconsciously favour male students over female, a bias which is thought to be one of the reasons for the low level of female physicists. In the study, psychologists from Yale asked 127 scientists holding tenured posts at six universities across the US to evaluate an excerpt from a job application for a graduate laboratory technician position. The application purported to be from a deliberately solid and competent, but not outstanding candidate. The only difference in the excerpt received was that for 64 of the scientists the applicant was called Jennifer, whilst for the other 63 the applicant's name was John. Here's the gender priming part: not only did the scientists rate the male applicant as significantly more competent and hireable than the (identical) female applicant, but they would also have given the male student a higher starting salary (about $4000 higher in fact). On a scale of 1 to 7, with 7 being highest, professors gave John an average score of 4 for competence and Jennifer 3.3. John was also seen more favourably as someone they might hire for their laboratories or would be willing to mentor. The average starting salary offered to Jennifer was $26,508. To John it was $30,328. The bias shown by the potential hirers was independent of their gender, age and seniority, indicating that even women show a subconscious bias against other women. The innate nature of the bias is thought to be evidence of the influence of a society-wide stereotype that men make more competent scientists. You'd think things might have changed since the mid-19th century when Charlotte, Emily and Anne Bronte first published their work using male pseudonyms because, as Charlotte later put it '… we had a vague impression that authoresses are liable to be looked on with prejudice..', but no, gender primed bias is alive and well. Priming through tasks can even help us to think in a more reasoned way, utilising our slower, more logical and conscious ‘System 2’ more, or in a less reasoned way using our fast, automatic and intuitive ‘System 1’. Amitav Chakravarti and colleagues have been looking at how to get us thinking more methodically and logically by priming us to engage our System 2. In two part studies, people were first primed with a simple personality test using either a broad or narrow categorisation (see images) and then set different tasks to complete. So one group filled in a test with just a few options (broad categorisation) such as ‘Are your eyes brown, blue, hazel or green?’ and another group completed a test with much more narrow categorisation eg up to nine grades of eye colour. The broad categorisation does not involve much thought – we can almost immediately categorise ourselves straightaway so we probably let our System 1 respond to this task. Matching our eye colour to nine options takes considerably more effort and conscious engagement. So researchers hypothesised that the narrow categorisation might engage System 2 more. They found that those primed with the narrow categorisation were generally less affected by cognitive biases when it came to tackling the subsequent tasks and suggested that narrow categorisation primes the brain to utilise System 2 and ‘work harder’, be less lazy and think through more criteria in order to come to a decision. People previously exposed to broad categories meanwhile were primed to behave with more of a ‘cognitive miser‘ approach, relying on short-cuts and fewer criteria. They may also be more affected by contextual cues, basing their decisions on fewer pieces of high impact information. new product assessment – consumers primed in the narrow group considered innovation and risk equally whereas those primed in the broad group weighed risk more heavily. So if you could just sit up straight, maybe start nodding your head up and down and now read on. The examples discussed here have shown the incredible (sometimes alarming) power of priming. It's both a tool and potentially a weapon and we need to think carefully about all the ways in which we can prime others and be primed ourselves. And in certain circumstances - when we're interviewing job applicants for example - we need to be on our guard against subconscious primed biases. When it comes to employing priming to work for us it can be as simple as a smile. Read more from Crawford Hollingworth. Carney, Dana R., Amy J.C. Cuddy, and Andy J. Yap. "Power Posing: Brief Nonverbal Displays Affect Neuroendocrine Levels and Risk Tolerance." Psychological Science 21, no. 10 (October 2010): 1363–1368. Bargh, John A., Mark Chen, and Lara Burrows (1996), “Automaticity of Social Behavior: Direct Effects of Trait Construct and Stereotype Activation on Action,” Journal of Personality and Social Psychology, 71 (2), 230–44. McGlone, M. S., & Aronson, J. (2006). Stereotype threat, identity salience, and spatial reasoning. Journal of Applied Developmental Psychology, 27, 486–493. Ülkümen, G., Chakravarti, A. and Morwitz, V.G. (2010) Categories create mind-sets: the effect of exposure to broad versus narrow categorizations on subsequent, unrelated decisions. Journal of marketing research, 47 (4). pp. 659-671.